Living in this tropical paradise since 1991, I have developed a vast knowledge of the Island of Maui, its people and their lifestyles. I am a full-time real estate agent. I have earned many awards over the years including Hawaii Business Magazine’s Top 100 and Coldwell Banker’s Top Producer and Million Dollar Producer awards. When buying or selling property in today’s real estate market, it’s important to have confidence in your real estate professional. My commitment as your local REALTOR® is to provide you with the specialized real estate service you deserve. As an informed buyer or seller, you’ll make the best decisions for your future. As your local connection with expert knowledge of the Wailea, Makena, and Kihei communities, my objective is to work diligently to assist you in meeting your real estate goals. 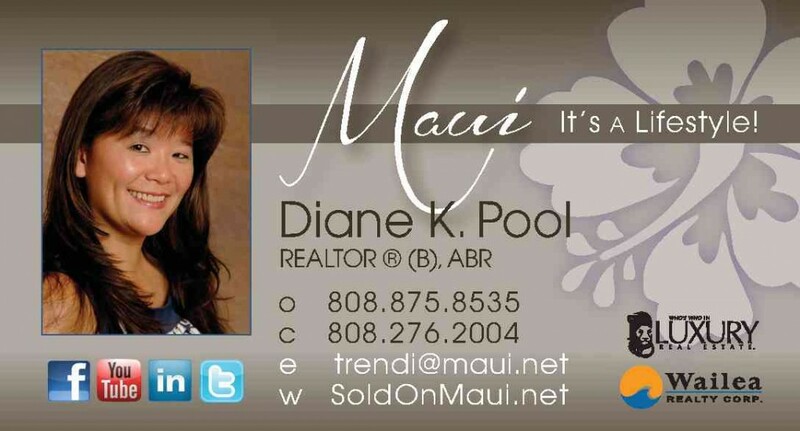 If you are considering buying or selling a home or condo or would just like to have additional information about any Maui real estate you can check out my website – www.SoldOnMaui.net, and please feel free to call or e-mail me. I hope you find this blog enjoyable and useful. I love feedback and comments too so please let us hear your thoughts on things.